Stable Orbit is a space station simulation game. Assume the role of station commander and build the next space station! The year is 2034 and it’s been five years since the International Space Station was deorbited. Space programs around the world have faltered. Against all odds, an unprecedented “All Nations Space Coalition” is formed around a shared desire to rebuild mankind’s permanent presence in space, and rekindle the space race. Who will lead this mission? You! Space is dangerous. Survival is a challenge. Design, build and control your own space station. Mission command and control is in your hands and only careful planning and vigilant supervision will keep your crew and space station safe. The latest update to Stable Orbit adds all new features to the game such as Research Contracts, Module Unlocks & Upgrades, Waste Management and more. The latest update, Vector, brings massive improvements to the the graphics to Stable Orbit, and adds more features to the core gameplay. Out now in Early Access! 2034 - The International Space Station has been deorbited, and space programs around the world have faltered. Against all odds, an All Nations Space Coalition has formed to reignite the space race. Stable Orbit is a space station simulation game that allows you to construct and manage your very own space station. Help chart the course of development as it's in Early Access, and see what crazy space stations you can create! Stable Orbit is a space station simulation game currently in Early Access. This video your messaging system in game. Help chart the course of development during Early Access, and see what crazy space stations you can create! Stable Orbit is a space station simulation game currently in Early Access. This video explains how vital your crew are in maintaining a space station. Help chart the course of development during Early Access, and see what crazy space stations you can create! Stable Orbit is a space station simulation game currently in Early Access. This video explains the importance of storing supplies on your space station. Help chart the course of development as it's in Early Access, and see what crazy space stations you can create! Stable Orbit is a space station simulation game currently in Early Access. This video looks at how to power your space station, and keep it from overheating. Help chart the course of development during Early Access, and see what crazy space stations you can create! Green Man Gaming Publishing has announced that the space station management simulator, Stable Orbit has now left Early Access. Another Stable Orbit update glimmers on the horizon, Blackout. This update is named after one of the myriad of problems your station may encounter once the update goes live: a communications blackout due space weather. While Blackout is still a few weeks from release, I'd like to take this moment to tell you about what is coming up. The ‘Perihelion’ update introduces Research Contracts, Module Unlocks and Upgrades, Waste Management and Module Intersection Detection. The latest update for Stable Orbit is called Vector and is now available via Steam. In this post, I’d like to update you on what I have been working on lately and detail the features I still have planned for Vector. If you like Kerbal Space Program and FTL: Faster Than Light, then this game is definitely for you! Stable Orbit does come with a handy manual, but here’s a nice little guide on how to get started. 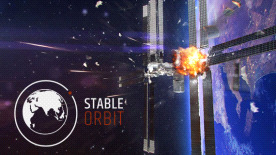 Stable Orbit is an Early Access title, meaning that the game is still in active development. The roadmap in this article outlines what is available in the game now and which features are still planned for future updates. The following Stable Orbit updates are all included in the latest build - All features are the result of player feedback, so thank you to everyone for playing, and let us know what you think of this latest update. A full changelog can be found in game. A new update for stable orbit is right around the corner! So we took the time to ask the games developer, Jim Offerman, a few questions about the update and all his thoughts about journeying into space. We’ve been lucky enough to get an exclusive Q&A interview with Jim Offerman, Founder of Codalyn and the man behind new space simulation game, Stable Orbit. Stable Orbit can be played on PC, Mac and Linux. Here are the minimum system requirements needed in order to play the game. To celebrate the Vector Update, this week Alex is playing Stable Orbit.